Plans and details for construction of a trailer to suit the Alloy Sea Boat and Alloy Sea Boat Mk2. Trailer is dual axle and fabricated from steel. 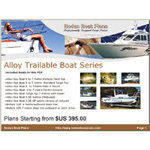 Study Plan PDF01 "Trailerable Aluminium Boat Series"
BB010 "Alloy Sea Boat - Standard Targa top"
BB020 "Alloy Sea Boat Mk2"